Are your white mugs discolored by coffee or tea stains? These stains can be particularly stubborn and difficult to remove, especially if they build up over time and really set in. However, there are a variety of commercial and homemade cleaners that you can use to get them out. It may take some elbow grease on your part, but your white mugs can be white again. Make a thick paste of baking soda and a little bit of water. Apply this to the stains and then scrub with a scrub brush or sponge. Rinse the paste off the mug and repeat if necessary. A new coat of paste should get deeper into the stains. Baking soda creates the perfect amount of light abrasion to remove mild stains. This is a more eco-friendly method that doesn’t require the use of bleach or dish chemicals. Heat 1 cup of vinegar over medium heat until hot. 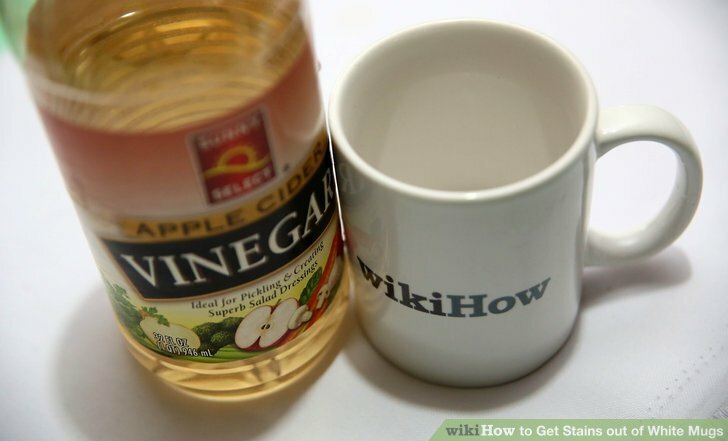 Soak the mug in the hot vinegar for 4 hours or overnight. Scrub the mug with salt. Wet inside of mug with a little bit of water. 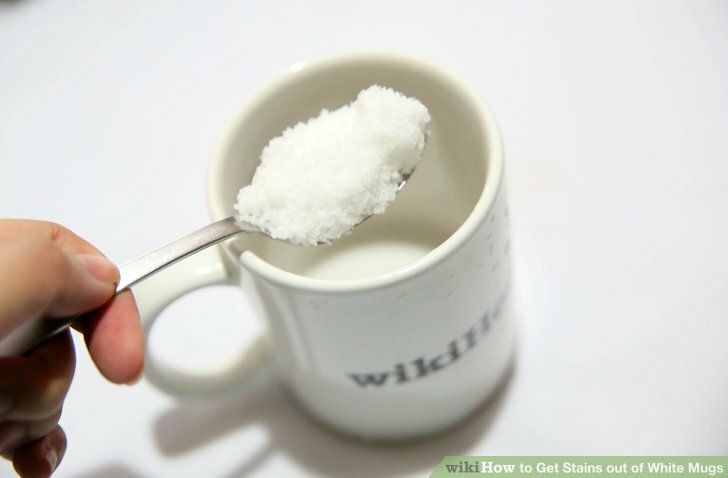 Add about a tablespoon of salt and scrub the mug until it is clean. The salt simply acts as a mild abrasive, getting into the stains and removing them. You can also use a lemon peel to scrub the salt into the mug. While the salt is an abrasive, the lemon is a bleaching agent, helping to eliminate the stains. Drop a denture tablet in the mug filled with hot water. The tablet should fizz and dissolve, all the while cleaning the stains out of the mug. Rinse the mug clean once the fizzing stops. Soak the mug in bleach water. 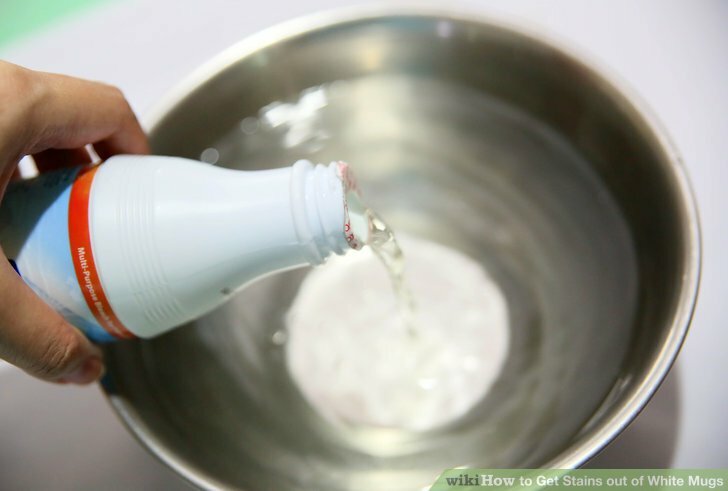 In a large bowl, pour in 1 gallon of warm water and 1 tablespoon bleach. 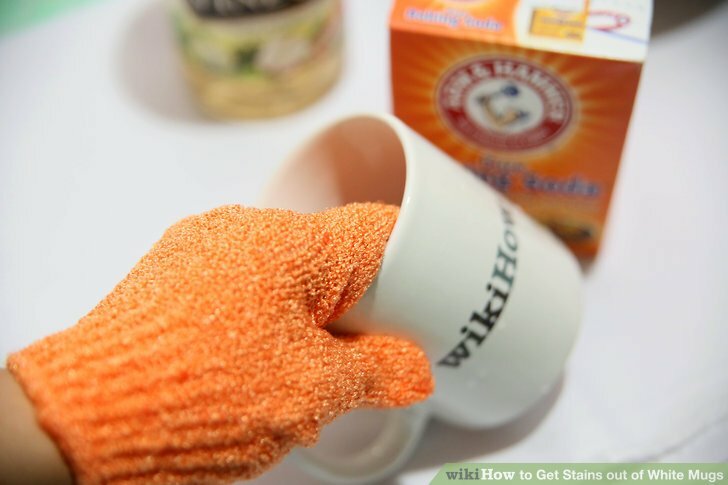 Soak the mug for as long as it takes for the stains to disappear, anywhere between an hour to overnight. Alternatively, you can use a scrubbing sponge to scrub the mug until clean. 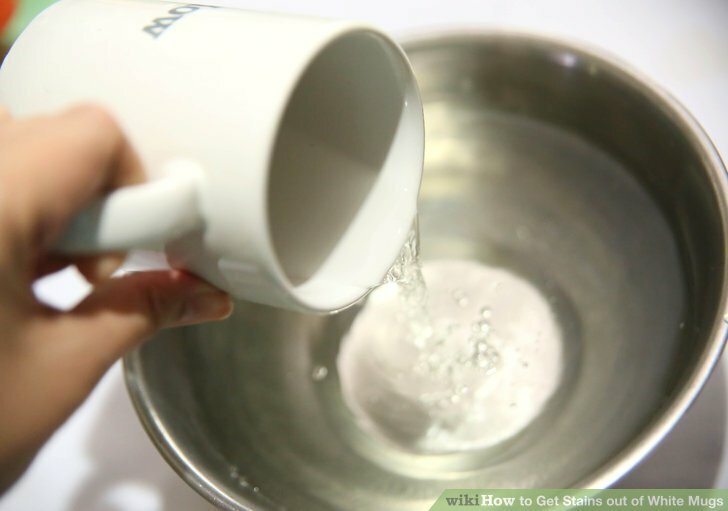 This is the strength of bleach water used to sanitize dishes. 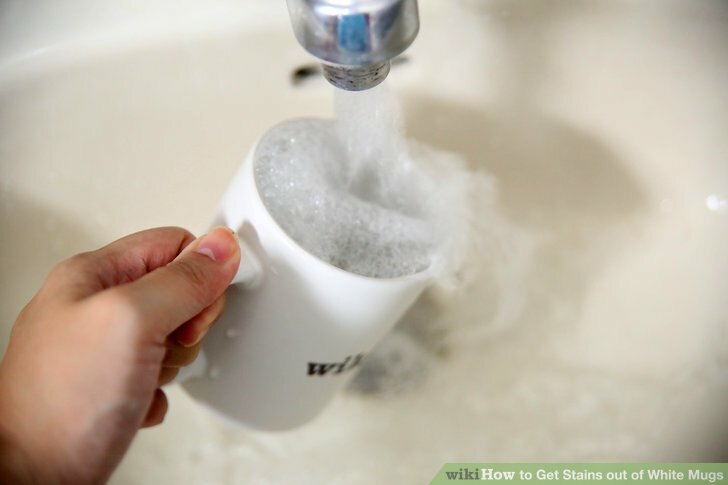 If your stains don’t come out, you can increase the strength of the bleach water but be sure that you wash the mug off very, very well afterwords. Use a magic eraser sponge. 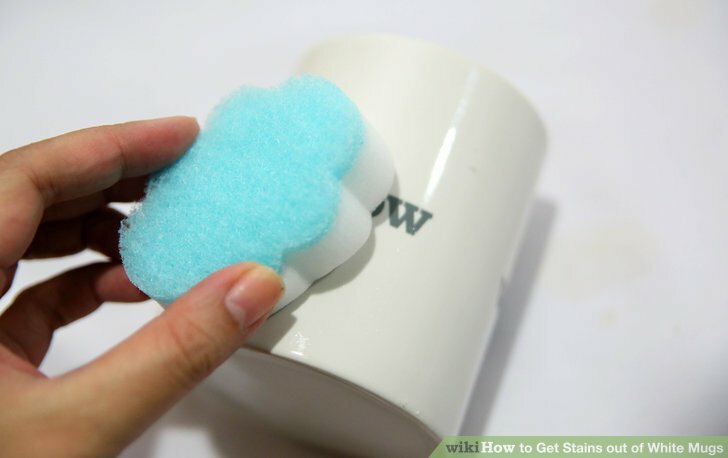 To use, rub a slightly damp magic eraser on the dry cup. Use a circular motion and a moderate amount of pressure. Rinse the mug thoroughly after cleaning. You do not want to ingest the magic eraser cleaner. Products such as Bon Ami and Barkeeper’s Friend can be very effective for cleaning ceramic dish ware. These products are usually combined with a small amount of water and rubbed across the surface with a cloth or sponge. Be careful with these products, however, as they can be too abrasive and cause scratches. To avoid this, test the product on the underside of the mug before using it on the the rest of the item. You can also use a high quality stain remover, such as Oxi-Clean. 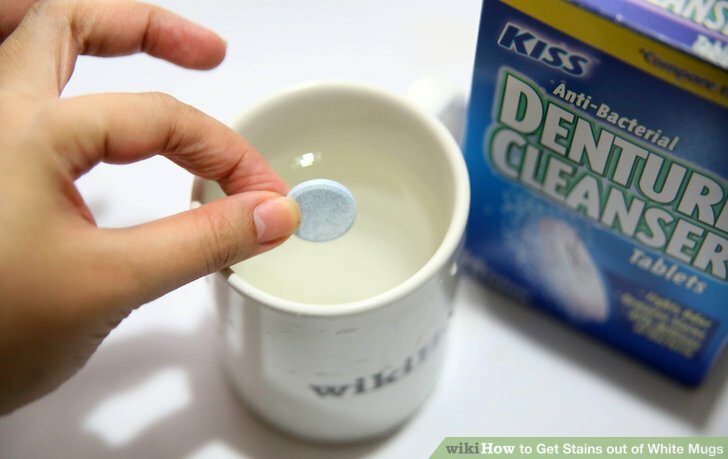 Add the cleaner to a mug of hot water and let it soak until the stains disappear. Once they are gone, rinse the mug thoroughly. Use professional espresso machine cleaner. This may be more of an investment than most people want to make but if you are really determined to get a white mug clean, buy commercial cleaner. The espresso machine cleaner is specially formulated to get at coffee stains in particular. Like all commercial cleaners, it is important to wash this cleaner off completely before using your mug again.